How did Ford Motors use Lean Development to pull off one of the most impressive corporate turnarounds in history? Largely by avoiding the mistakes that so many companies make when in a death spiral. They looked beyond manufacturing efficiency to change the very fundamentals of how they developed vehicles. 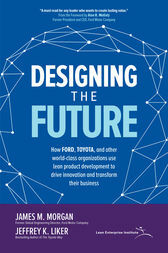 In Designing the Future, Lean product development expert James Morgan and world-renowned Lean guru Jeffrey K. Liker reveal why so many companies have achieved only moderate success with Lean in operations, with a limited impact on their overall business. They take you through the process of bringing the best of Lean management to your enterprise—in order to link your business strategy to superior value designed for customers. The authors provide an actionable approach to building a better future for your business fueled by an iterative, integrated process that relies on simultaneous engineering, linking strategy and vision.They illustrate how to empower skilled and talented people to make collaboration and innovation a habit—hour to hour and day to day. It’s the secret of full implementation of Lean—and this groundbreaking guide takes you through every step of the process. The best way to predict the future is to create it. With Designing the Future, you have everything you need to create a flexible, iterative business-transformation process that takes you from strategic vision to value stream creation for maximum customer value delivery. James M. Morgan is Senior Advisor at the Lean Enterprise Institute and founder of LEI’s LPPD initiative. Dr. Morgan is a multi Shingo Prize winning author, researcher, and a globally recognized expert in product and process development. Prior to joining LEI, he spent more than thirty years in industry as a product development leader including serving as a global engineering director at Ford Motor Company during the product led revitalization under CEO Alan Mulally.